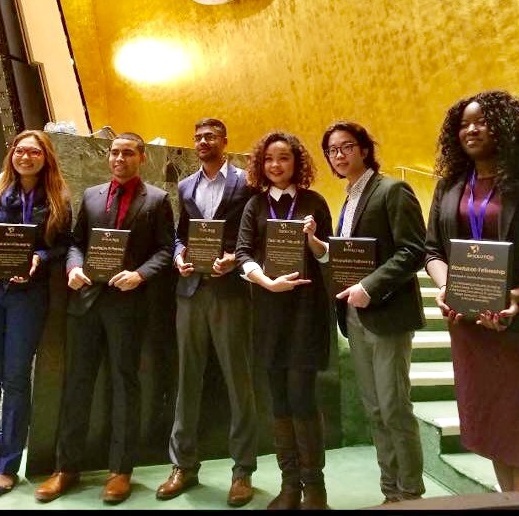 Ms. Louise Mabulo, an Associate in Arts (AA) student of the Faculty of Education, University of the Philippines Open University (UPOU), received a recognition as an Outstanding Campus Ambassador in the 2018 United Nations Winter Youth Assembly held on February 14-16, 2018 at the UN Headquarters, New York City, USA. Ms. Mabulo is formerly a delegate of 2017 Winter Youth Assembly where she was awarded a Lifetime Fellowship from the Resolution Project, a global community and organization which awards outstanding youth-led social ventures. Her social venture, The Cacao Project, was chosen as one of the top five outstanding social ventures among 69 countries and 300 submissions. The Cacao Project is an initiative which aims to provide the local farmers of San Fernando, Camarines Sur a source of income through the sustainable farming of cacao seedlings. This year, Ms. Mabulo returned to the Youth Assembly as a Campus Ambassador. With the theme “Innovation and Collaboration for a Sustainable World”, the 2018 Winter Youth Assembly is a “platform to elevate the voices of young people in international dialogues, empower youth to advocate for future generations, and mobilize youth as agents of impactful change”. At present, Ms. Mabulo acts as a Youth Ambassador for the United Nations Youth Assembly. As a Youth Ambassador, Ms. Mabulo is in-charge of screening, assessing, and approving members of the Philippine delegation to the United Nations. She is also an internationally-acclaimed chef, a regular speaker for culinary and tourism events such as Dine Philippines, an entrepreneur, an agriculture advocate, and a competitive archer. Ms. Mabulo is currently studying Associate in Arts offered by the Faculty of Education at the UPOU. She remarked that her experience as a UPOU student has been essential and constructive. “UP Open University has allowed me to build my Social Ventures, address the demands of my work, focus on my personal career, gain unique experiences, travel, and engage in important activities and events, without sacrificing my education,” she noted.